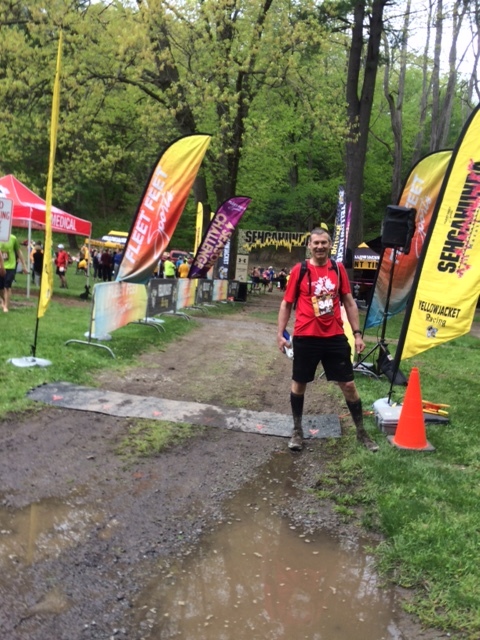 It was just after finishing the Sehgahunda Trail Marathon (pronounced Say-ga-hunda) held in Letchworth State Park, New York. I was stretching out my muscles when a very fit lady in her late twenties walked by, smiled, and said “That Was An Intense Race”. This same lady went by me with a couple of kilometers to go in the race. After over 6 hours of running up and down hills and gulley’s, the course had flattened out to the finish. On this flat stretch the lady had found some reserve to pick up the pace to power to the finish. As she went by me I called out “You’re doing great”, and she replied “Great job yourself”. The words “You’re doing great”, “Great job” or variables of it were given to me all day, and at the same time I was giving them out to others. It was a tough course, but there was such a positive encouraging vibe to be found out there. 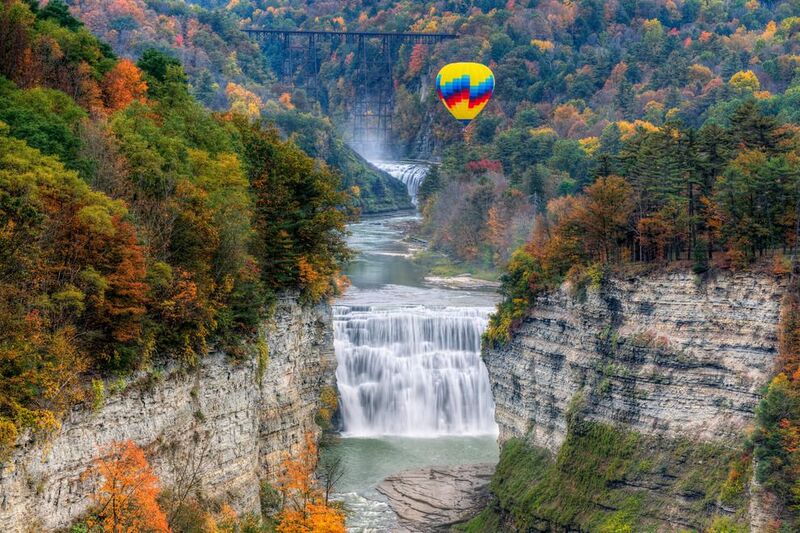 As the “Grand Canyon of the East“, Letchworth State Park was determined by a popular vote in the 2015 USA Today Readers Choice Awards to be “The Best State Park in the United States“. And on November 4th, 2014, Men’s Health Magazine published an article “4 Epic Races to Run Before You Die“. 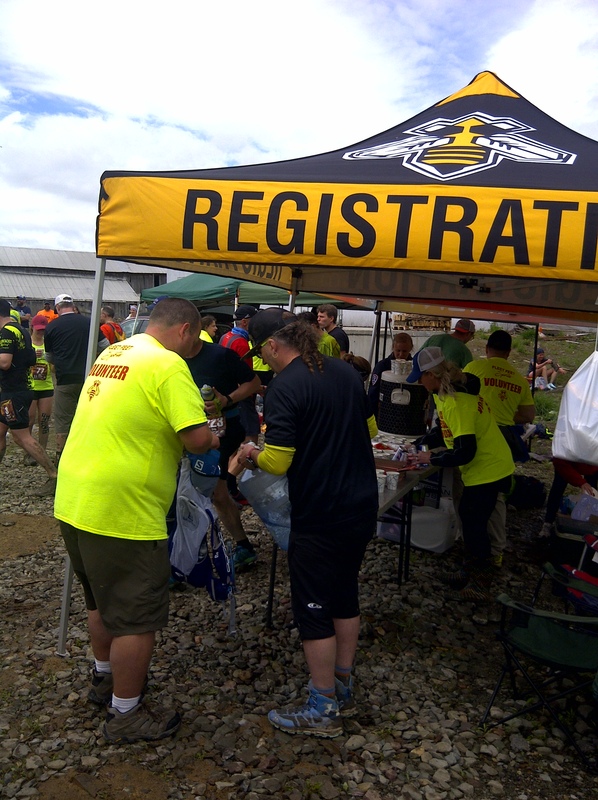 It mentioned that “There are 1,400 trail races to choose from in the United States. Put these 4 at the top of your list”. 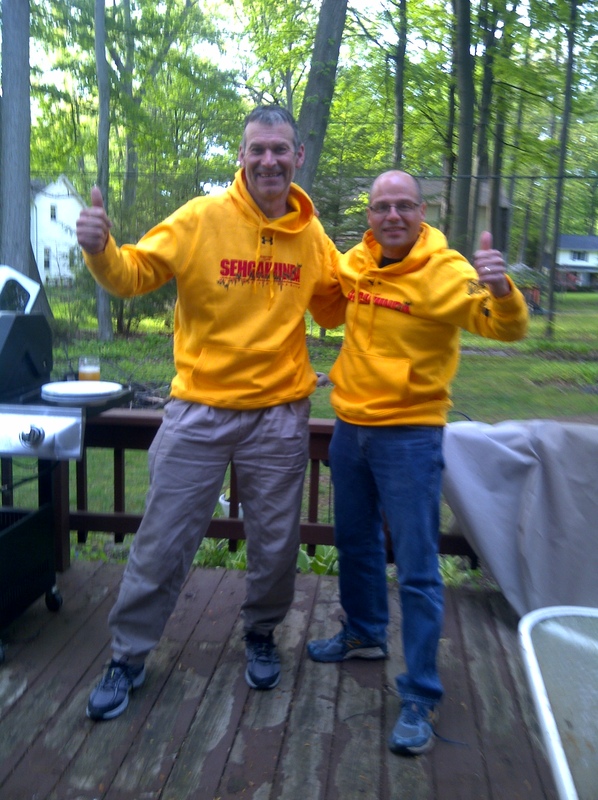 And at the very top of that list of 4 epic races was the Sehgahunda Trail Marathon, held in Letchworth State Park. 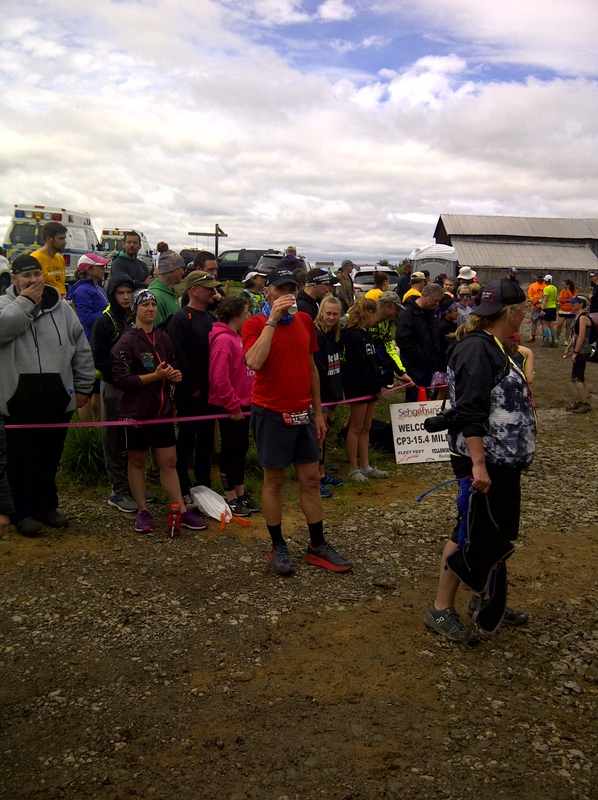 Men’s Health described it as “Breathtaking scenery and lung-busting mountain terrain make this 26.3-miler, which follows a section of the Finger Lakes Trail, a must-run for the superfit”. 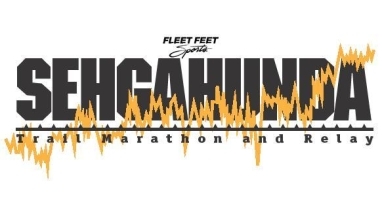 The Sehgahunda Website mentions that “Sehgahunda is a highly technical trail (ultra)marathon clocking in at just over the traditional marathon distance-26.3 miles”. It also mentions “It may just be one of the hardest trail marathons in the east”. Many of the trails that make up this race are the very trails used by the Seneca Indians to access the Genesee River, which bisects this valley, giving rise to its nickname “The Grand Canyon of the East.” The website mentions there are “Over 100 gullies to descend and climb, lots of rocks, roots, ruts, leaves, and gullies to maneuver over, under, and around, and short climbs, long climbs, very few flats”. All this has to be completed within an 8 hour cutoff. Traversing one of over one hundred gullies for the day, Daniel (my gracious host for the weekend) is leading the way. The course needed completion within an 8 hour cutoff. So how did I end up at the starting line of one of the most epic trail races in the United States, held in the best State park in the same country? It is quite an amazing story. It all came about from an invite from a man named Daniel, who is a blog and twitter follower way back in October last year. Daniel ran this same race course 2 years ago. I have never met him in person before, but he is very much an internet friend. Daniel mentioned all I had to do was register for Sehgahunda, show up and everything else would be taken care of. It was a really amazing offer. Daniel writes a blog which I follow called “Straight Line“, which is one of the most humorous and upbeat blog reads out there. One of my favourite recent post is his “Running Goals for 2018“. Looking fresh at the start line of Sehgahunda. Even with such an amazing offer I was still hesitant. My Pick Your Poison ultra would be only 3 weeks before Sehgahunda. Would my almost 60 year old body be recovered enough to handle Sehgahunda? Daniel and I did share a lot in common. 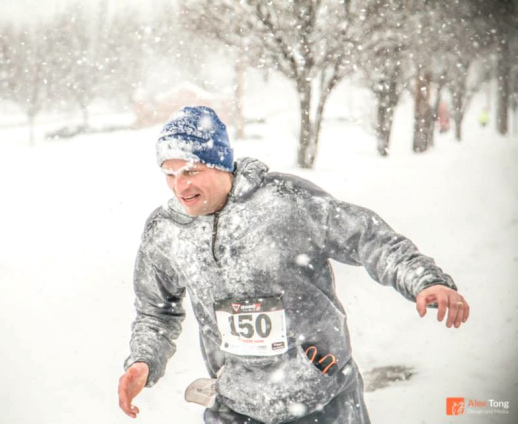 We both were in our 50’s, we both shared a Christian faith and we both had running styles which could be described as “extreme”, which included a love of winter running. Yeah, we could almost be twins. But then the concerns once again come, “Would I be slowing down Daniel”? I am not a fast runner. And there was the concern of how much inconvenience would I be to the family. And they also get to see me AFTER the race when I am all sore and achy. Would I be a miserable guest? Daniel enjoying his winter run. Image source from Daniel’s blog Straight Line. It took me over a week to eventually register for this event after Daniel’s extremely generous invite, and I just snuck in. A day later the 300 openings to this popular epic race had sold out. That was five and a half months before race day, which is incredible. This was indeed going to be an adventure. To add to the adventure, in the middle of March, I got my tickets down to Rochester, bus travel for going down, and train travel for coming home. Eventually Friday May 18th had arrived early with a 4:00 am wakeup to make my 1st connection that would eventually take me to Rochester, New York. On arrival I was given a wonderful tour of Rochester and area from Daniel. Spring in Rochester, New York is at least 2 weeks ahead of me up here in Canada, and it was so glorious. And all my concerns of being a guest in Daniel’s home? I was so comfortable there, and our families share so much in common. Their home is furnished with roadside and garage sale treasure finds, just like ours. They drink their coffee black, just like myself. They have 4 children, with one living far away from home, just like ourselves. They eat healthy, recycle and care for the environment, just like ourselves. And the door is like a revolving door, just like we have. So much activity, with school, jobs and functions for everyone, it seemed so similar to our home. One son was going to a prom on Friday evening and working other times at a vet office. Another son was busy at a lilac festival, and the youngest went off to a boy scout adventure. This 12 year old young man has his own You Tube channel called The Plaid Mongoose, which does old technology reviews. I grew up with many of these products and find these reviews so fascinating. This review is the Kensington System Saver for vintage Macintosh computers. 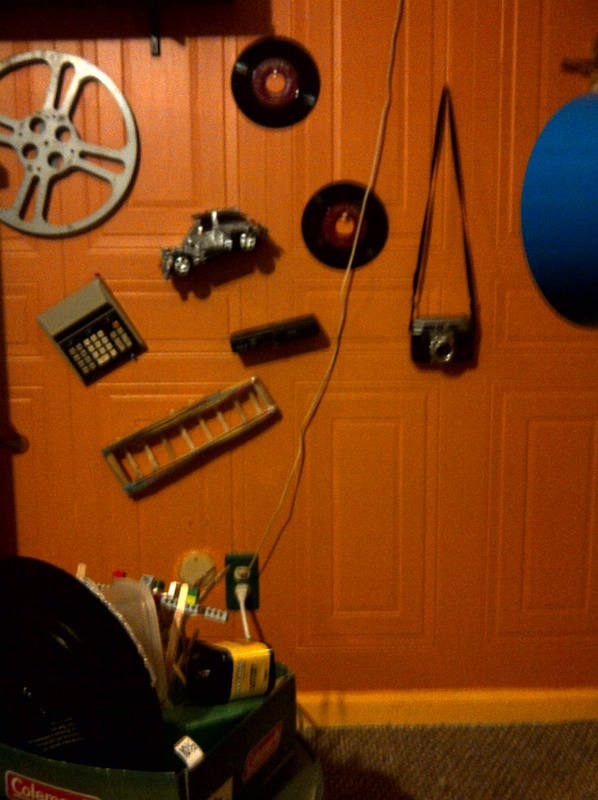 The “Old Technology Wall” where Daniels’s 12 year old son Dominic shoots his You Tube videos. It is quite ironic, I was trying to make last minute arrangements with Daniel, and our own modern computer technology had failed. We lost our internet for a few days. I gave Daniel a phone call the night before I was to leave and his last words were, “Bring rain gear, you are going to need it”. 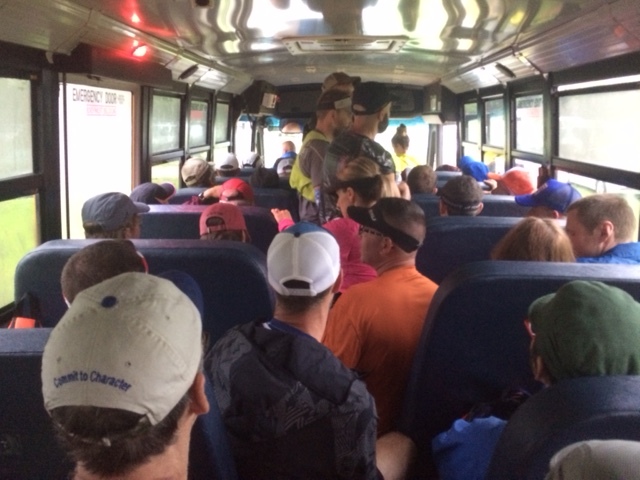 The rain was going to make an already challenging course that much tougher. I had that gut feeling this was going to be very muddy. Because many parts of the trail are on remote areas, a minimum 16 ounces of water are required on each runner at all times. The rain lasted for two hours into the race, but things stayed greasy for much longer. This was my 1st point to point race. Daniel and I parked at the finish line at the bottom of the park. We were bussed to the top of the park, and we ran the park from top to bottom. 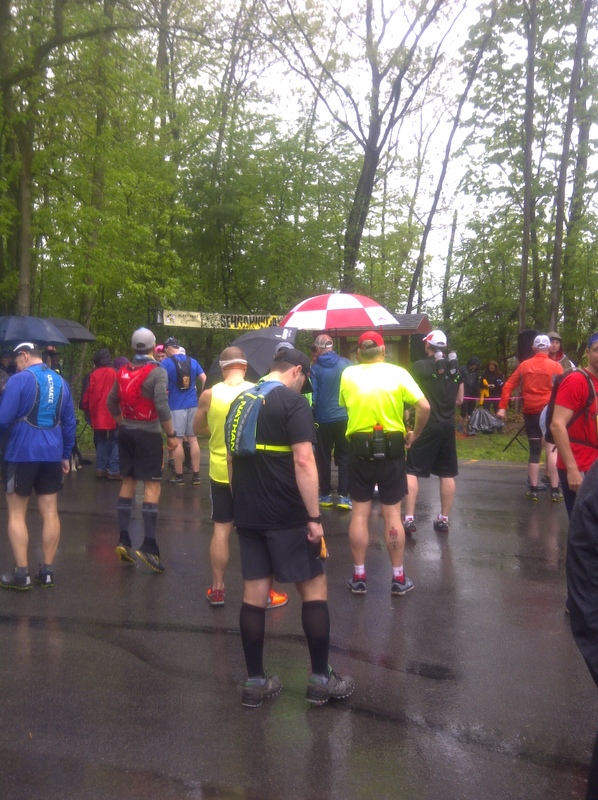 Runners gathering at the rainy start line. In the end neither of us used our rain gear as it was fairly warm. This predominantly single track course is so breathtaking beautiful I knew I needed to take pictures. The challenge was to get some pictures and try to keep up with, and not slow down my running partner Daniel. Sometimes by the time I got a picture taken, and sealing the camera back in a zip-lock bag to protect it from the dampness up to 4 runners would go by. It would then take me as much as 5 minutes to try and catch up to and find a safe spot to overtake those runners again and work my way back to my running partner. Some places was so breathtaking, I could not help but stop for a picture. Careful footing really is needed on some sections, due to some serious dropoffs. Having Daniel there was a blessing, otherwise I would have been taking WAY too many pictures. Every gully, every little waterfall, every stream crossing and every mud bog seemed worthy of a picture. In the end, I tried to capture just a bit of everything of the course. The breathtaking beauty gave strength through those extremely physically and mentally challenging technical and muddy sections. Lots of stream crossings. 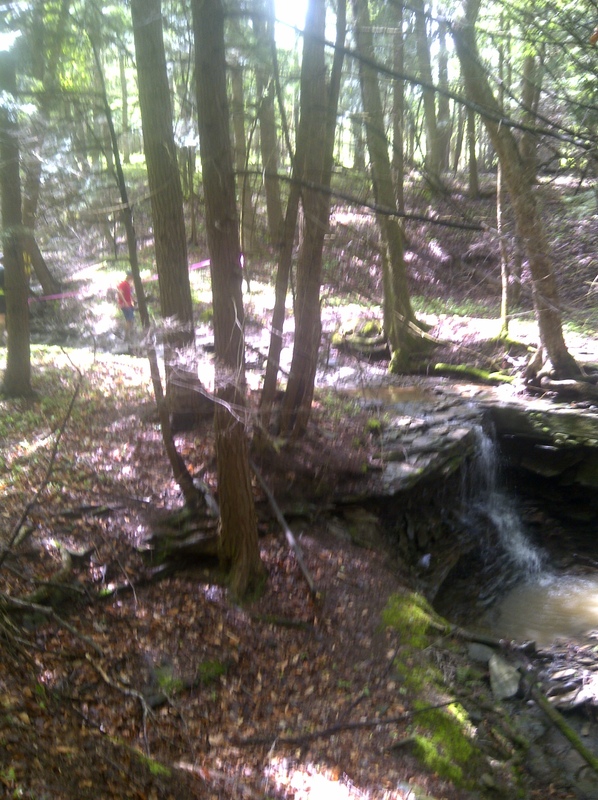 Many over slippery, flat shale rock. Then there was the mud. A challenge physically, but maybe even more mentally! It was really wearing me down. 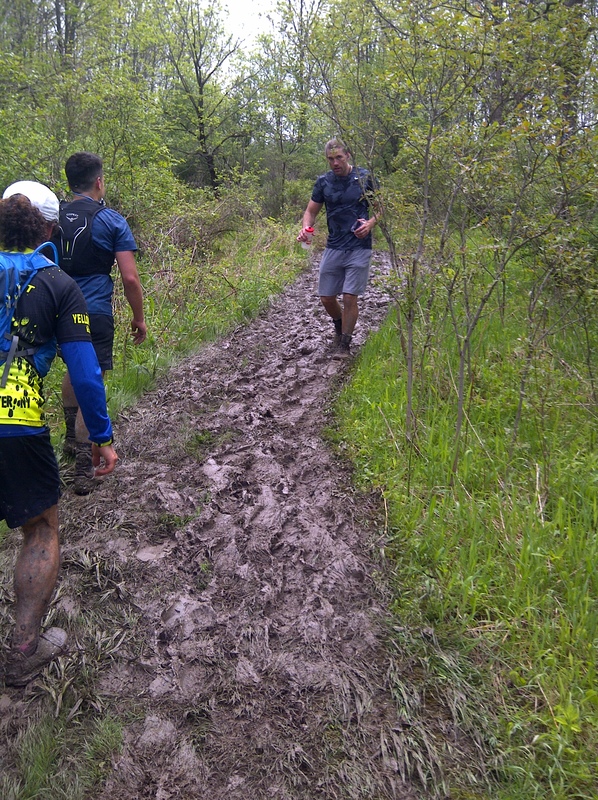 My lowest part of the race ended up being the mud coming up into checkpoint number 3 (at the 25 kilometer or 15.4 mile mark). And then something amazing happened when I reached the checkpoint. The mud felt like it was never ending. It was heavy. It was deep. It was relentless. Every step the footing was dangerous, and could so easily wrench an ankle or knee. It sapped the strength from me. You could feel the suction from the mud as it tried to pull my shoes off my feet with each step. It was uphill, and I was so exhausted. One step at a time I kept forging forward until I rounded a bend and was met by a thunderous cheering of what seemed like a couple hundred spectators who had gathered at the checkpoint. I was in tears. There was food here to replenish my energy stores. I topped up my hydration pack. But the biggest thing I got from that aid station checkpoint was the mental boost from those spectators (who are only allowed at the checkpoints). This course was not going to beat me. Picture captures only a small portion of one of the large crowds of spectators at the checkpoints who ended up being “gamechangers” for me. So appreciative for each and every one of them. So appreciative to the many, many race volunteers who worked so hard and were so supportive and friendly. Very much appreciated. THANK YOU! Feeling renewed many spectators had their hands outstretched to “high-five” me as I headed back on the course. 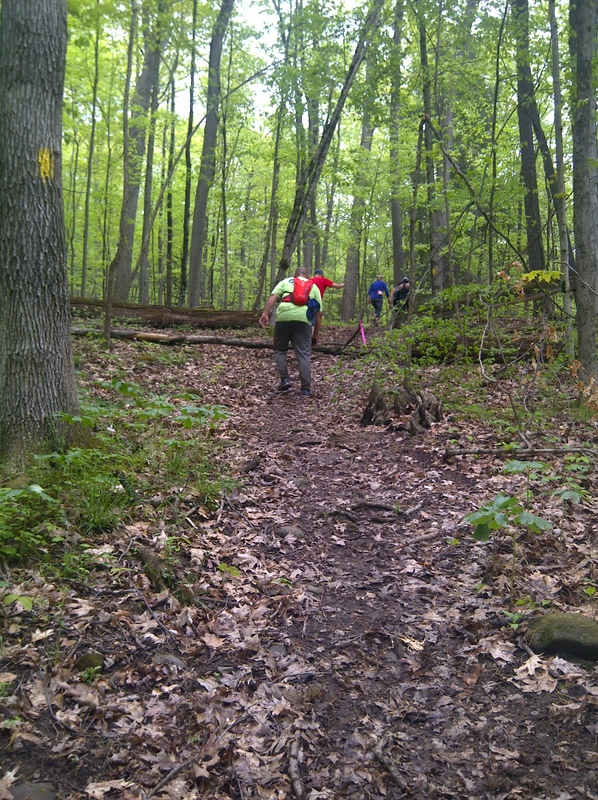 These checkpoints are an “out and back” from the main interior trail to a road access for supplies. 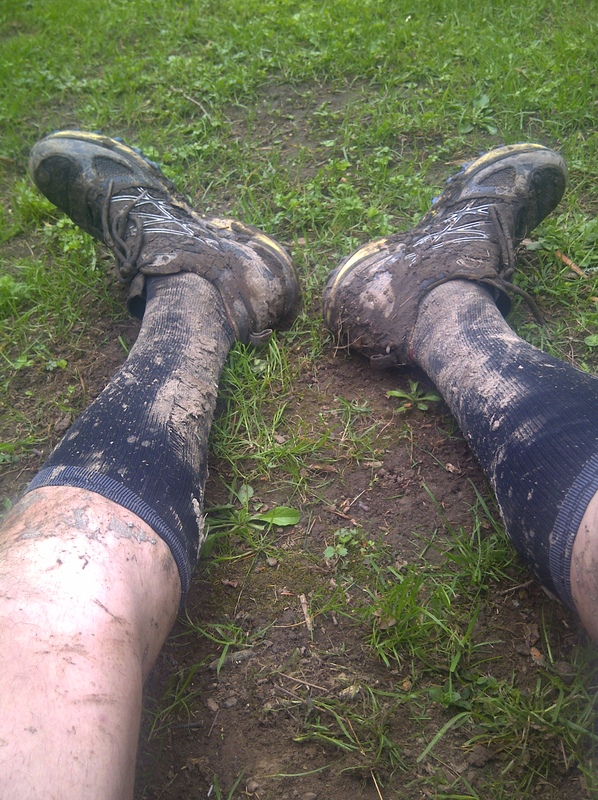 For me it meant I had to slog through the same mud of the “out and back” being ever so careful not to twist an ankle or knee or lose a shoe. Not sure which “out and back” this one was. There were 8 checkpoints, and the 1st 7 were “out and back’s” from the interior. These were the only sections where you loop back and were often very muddy. The main trail had some mud but nothing like the “out and backs”. The other challenges are the rocks, the roots and the constant ups and downs of the gullies. The stream crossings require special attention. They can be steep, and the flat smooth shale rocks are very slippery. Concentration on these trail courses (particularly on a course I have never run before) is so important. It is so easy to have a fall and they can happen so quickly. I still consider myself a novice trail and ultra runner and I am still learning so much. From past leg cramping issues I now carry salt electrolyte tablets right on me. At around the 30 kilometer mark I was able to give a couple of salt electrolyte tablets to a runner in immense pain who had serious leg cramps. My hope that he got those tablets in enough time to make it to the next aid station before the muscles eventually seize up. It made my day when that same runner found me after the race thanking me profusely and saying “It saved his race”. I know from my experiences of ultrarunning any runner would do the same for me. Some of those gully climbs were long and steep. Due to a week of recovery from my Pick Your Poison 50k race 3 weeks earlier and a tooth that was pulled a week before Sehgahunda, I had only managed two short runs right smack in the middle of those 3 weeks. 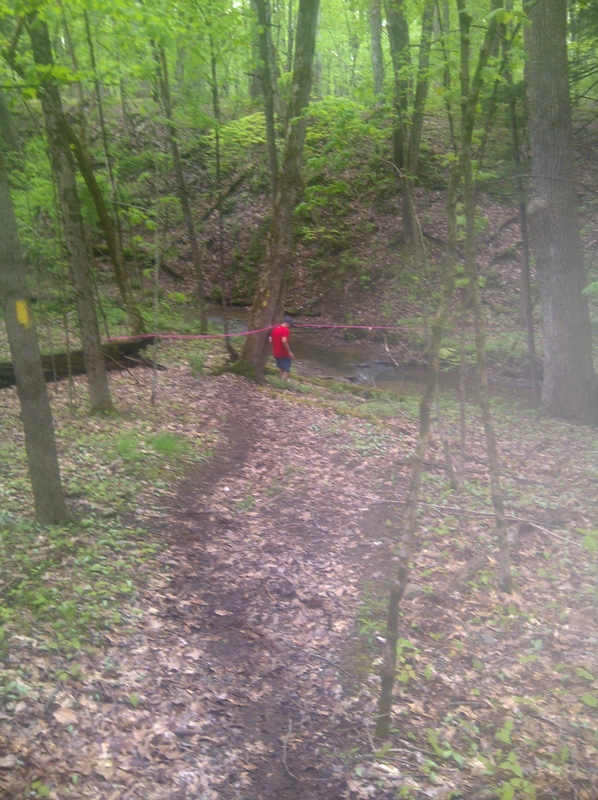 I had run longer trail courses than this one, but this Sehgahunda seemed one of my more technical. The course was beating me up and had taken its toll on me. I was feeling peaked. The final stretch was said to be much flatter after the last checkpoint and Daniel seemed much fresher than I was. I no longer had a concern of not finishing, as I was well ahead of the cutoff times. I told him to go on ahead. I did not want to hold him back. Daniel ran this course two years before, and he wanted to beat his previous time. Probably not as prepared as I should have been, the technical terrain, the elevation changes and the mud all took a lot out of me. Those final 3 or so miles was indeed gentler. As I watched Daniel pick up his pace and distance himself from me, I looked around and took in those new vivid greens of the deep forest around me. I love the beauty of spring so much. I listened to the enchanting songs of the birds. 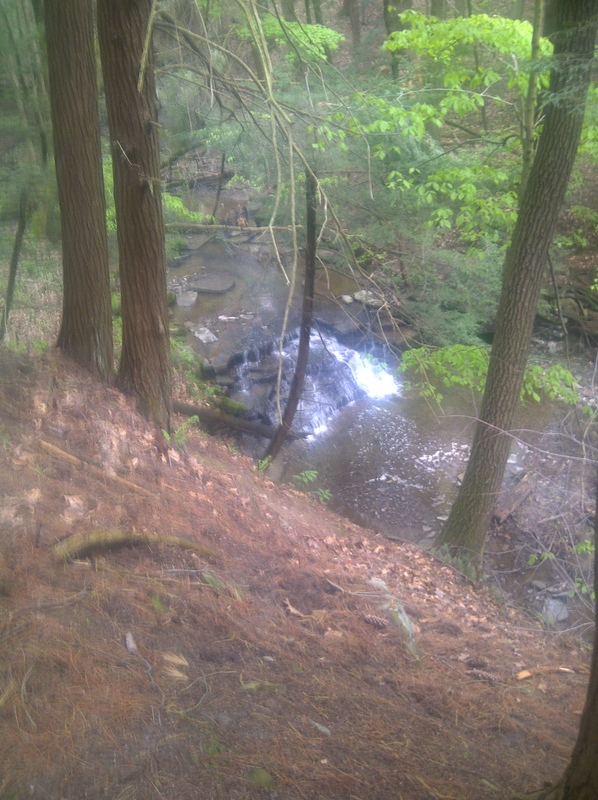 I thought of the Seneca Indians who travelled these same trails for centuries before. It would have such a different world without automobiles, and computers and homes with central heating and air conditioning. Untouched, unaltered raw nature. I have so much awe and respect for our native ancestors. It was a beautiful “wind down” from such an intense day. The final 3 miles to the finish line was flat, gentle and dry running terrain. Never did get a picture of the canyon itself. This photo credit to USA Today. A big Thank You so much to Daniel from the blog Straight Line, and his dear wife Maria for hosting me. Thank you driving me to and from Sehgahunda. This race definitely lived up to it’s status. It was epic and the course pulled me through such a pendulum of different emotions. I can actually now say I have run “One of the 4 most epic races to run before I die”. We are already talking about another race destination, maybe in Canada, maybe in the US, or maybe in another country different altogether. Daniel and I the night before in our wonderful Sehgahunda hoodies. Where will our next race be together? I always love running these races mostly for the experiences. But if interested, here are the stats. Came in at 143rd place. The age group placements, you will find me in the 50-59 male chart. Also, here if interested are my readings from my Suunto Movescount. These North Face trail runners have carried me through some pretty tough races. This finishers medal is so incredible and will always be cherished. 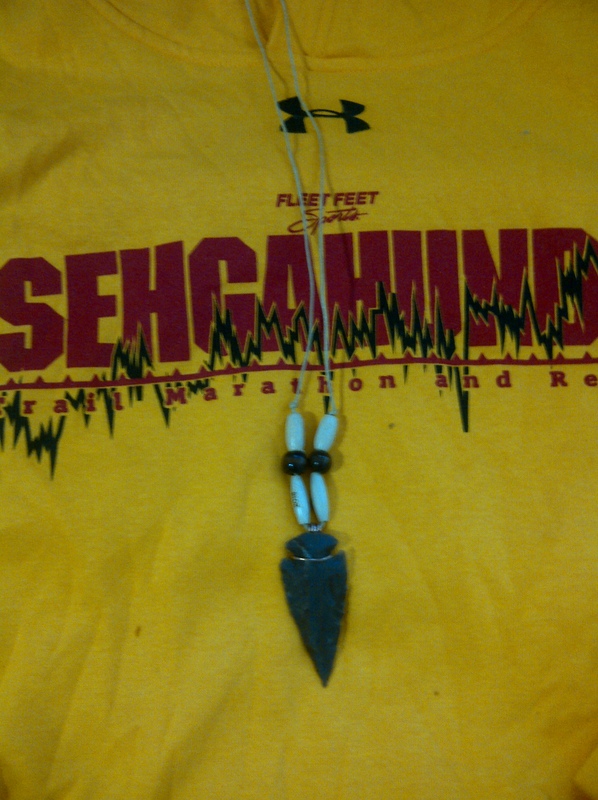 A Seneca Indian Arrowhead. As I come across them I will add other race recaps of Sehgahunda 2018 here. The Daily News: An excellent article written by Jessica Dillon of Batavia News titled, “Mud, Blood, Guts and Glory at Letchworth’s Sehgahunda”. Relatively Random: This race recap on Sehgahunda is tremendously captured by Craig Deats in a post titled Dancing with Lady Sehgahunda. 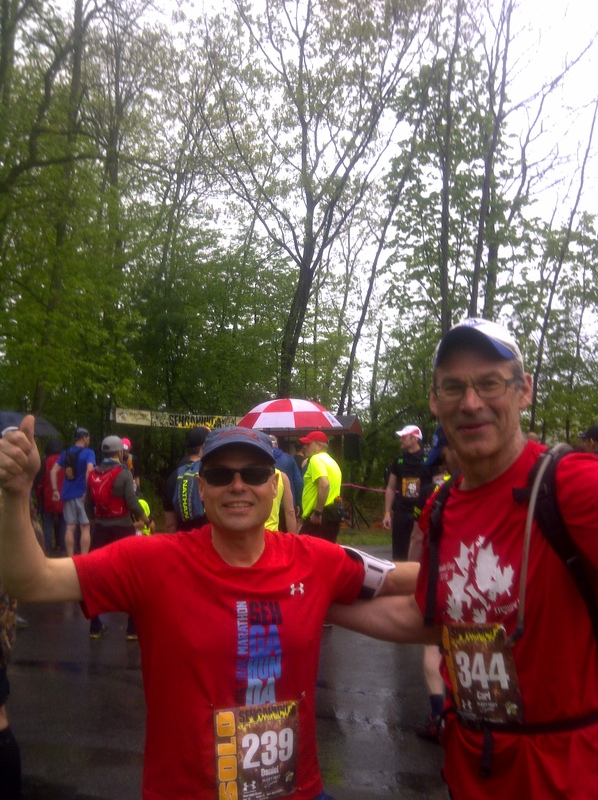 This was Craig’s 1st marathon (and trail marathon) and he tore up the course finishing well ahead of Daniel and myself. Craig captured the pain and glory of Sehgahunda so accurately, it brought me right back on that course. A great write-up Craig. Wow that sounds like quite the race! can I share this Carl? Just loved this article! 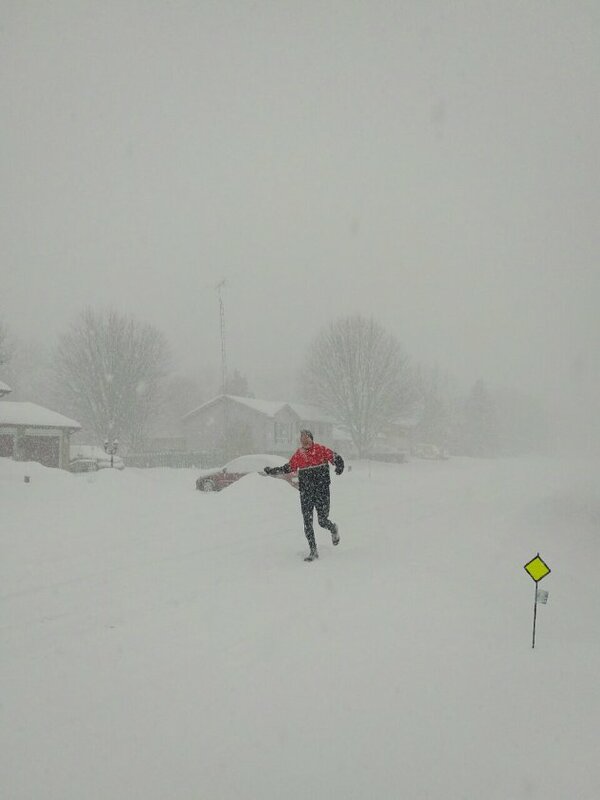 Our running community is seriously amazing. Love how he opened his house for you – I’m sure he enjoyed every minute as well. We hosted guests this past weekend – they came all the way from Morocco for their son’s college graduation – we squeezed in a girls night and half marathon. I’m still smiling from all the fun we had as 11 of us traveled and ran together – road race this time. 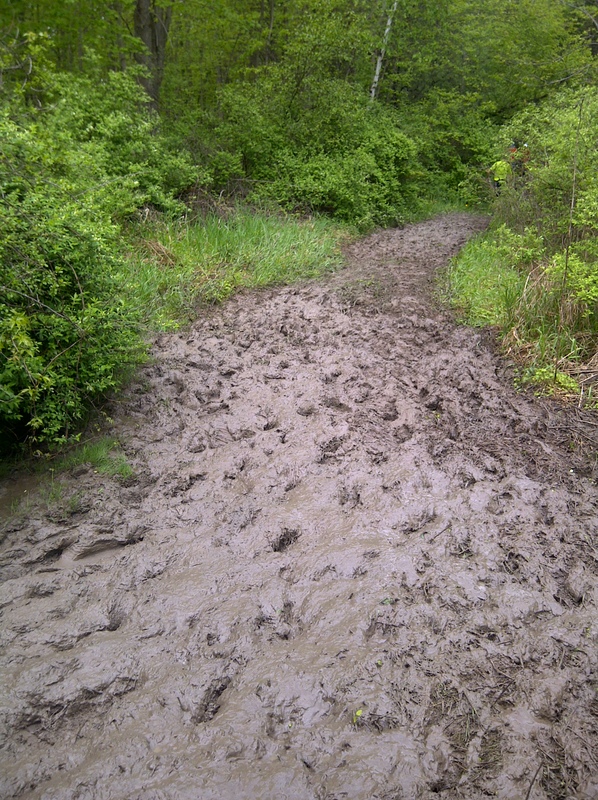 This mud does not sound fun – I can imagine the weight and how hard it must have been to keep going. Congratulations! You ROCK! Suz, thank you for sharing this. That would have been so much fun having guests from Morocco, and then running the half marathon. Would have been so incredible. Daniel and I had a blast. I am still amazed of his offer. The running community is so beautiful. It was so much fun. I’ll share a bit in my next blog post. What do you have planned next? Wow – that is exciting. I’ll have to check out the race. Good luck training – stay healthy and don’t over train. Good for you Carl….amazing race and between the narrative and pictures, you took the reader along with you!! Love the setting, so green and beautiful!! Great post, great race and thanks for sharing! Awesome post Carl! It sounds like a physically grueling yet very spiritually rewarding time. I love too how you were able to appreciate God’s nature gifts to us during the event when you’re mind probably wanted to concentrate on how tired and/or in pain you felt. That’s really the key to things. It seems like you have a special friendship with Daniel. I look forward to hearing about more adventures with you two! Thank you Tricia for taking the time to read and share your wonderful comment. There was definitely times I just wanted to sit by one of those waterfalls and enjoy it to the fullest. So fortunate to get many micro glimpses during the race of all the beauty while at the same time concentrating on the course. Those micro glimpse are tucked away now. Impressive! Wow, you are the only one in the age group! That’s very special!! That mud looks like obstacles in ocr’s or if you’re in the last wave, the ocr trial or obstacle ground despite straw making it easy grip. Other ocr’s runners I’ve ran with/along side call it chocolate milk or chocolate mousse as it’s usually up to our ankles! Happy to stop by! 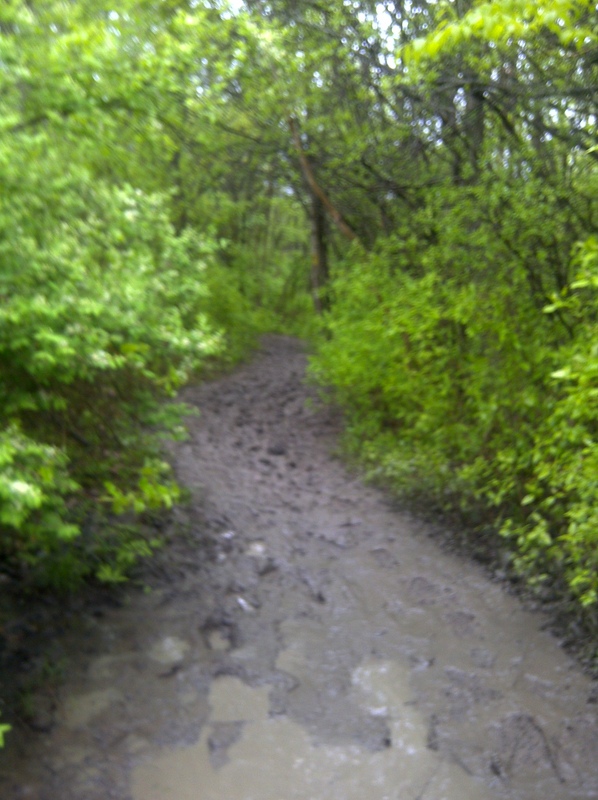 Most of the mud on obstacle courses is part of the trail, through streams, stream banks, after rain or boggy patches. They like to make the terrain as much as an obstacle as possible! Some races do soak the ground, but usually it’s what nature provides. I like that how they let the terrain be the obstacle. Mud can really “bring a person down” especially if it just does not seem to stop. Congrats on getting another epic race in the books! I would have been like you – stopping to snap all the pictures (then again, I would have been walking, not running, so it’s probably easier)! Lol you and your picture taking! Plus it sounds like you made a lifelong friend there in Daniel. So with your healthy lifestyle in general and apart from a few after-race aches and pains do you feel the benefits of your runs from day to day? i.e do you find yourself bounding up stairs whilst others of similar age are puffing whilst walking up much slower? Do you bounce out of bed in the mornings full of energy? Or what what would you say is the positive impact to your day to day life? And congrats BTW! Thank you so much for stopping by to read and share. Daniel is amazing, and have definitely made a lifelong friend. What great thought provoking questions. Life is busy, and I do have my days where I don’t have the motivation to get out running. It happens more often than most people realize. It is during these unmotivated days I have to look back over 6 years to see where I have come in my running journey. Six years ago when I started running I could not run 1 kilometer. Back then my blood pressure and cholesterol was high and my doctor gave me 6 months to get my act together saying “You don’t want to be on statins and blood pressure meds the rest of your life”. So that is when I took up running. I struggled with anxiety, and my running has helped all of this. On those days I don’t have the motivation, I have to remind myself how far I have come. Once I get out there running I feel great. Overall I do have more energy (yeah I do often run up stairs)…lol. Though often my energy when I get out of bed is in direct relation to how much sleep I got. If I don’t get 6 hours sleep, it shows. So you can see, there is a lot of variables. I actually only have been running this year twice a week, but have been including a lot of crosstraining with things like boot camp and yoga to build a strong core and become more flexible for these race events which seem to be getting longer and longer. As I am getting older, I am finding this crucial to keep myself injury free. It is amazing that we have these simple holistic health solutions available and people either don’t want to or don’t know to use them. I’m kinda not surprised by all these benefits, but it is always great to be reminded via someone else’s journey. You appear to have it sewn up with the physical, mental and spiritual intertwined with all your activities from yoga and running to your faith. 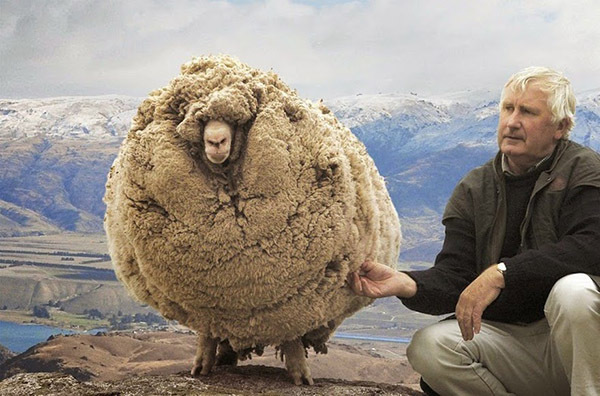 You’ve got the aerobics sorted and the strong core stuff in there. Frankly even without asking it can be seen in your stance in the pics. Yeah and all that looking back stuff totally shows you how far you have come on those unmotivated moments, so they are never really wasted, especially as rest is as good a medicine sometimes. One of your greatest friends though has to be your doctor. He could have so pushed you in the direction of Big Pharma and made you a lifelong client and instead directed you to natural means, or at least what he said led you there. 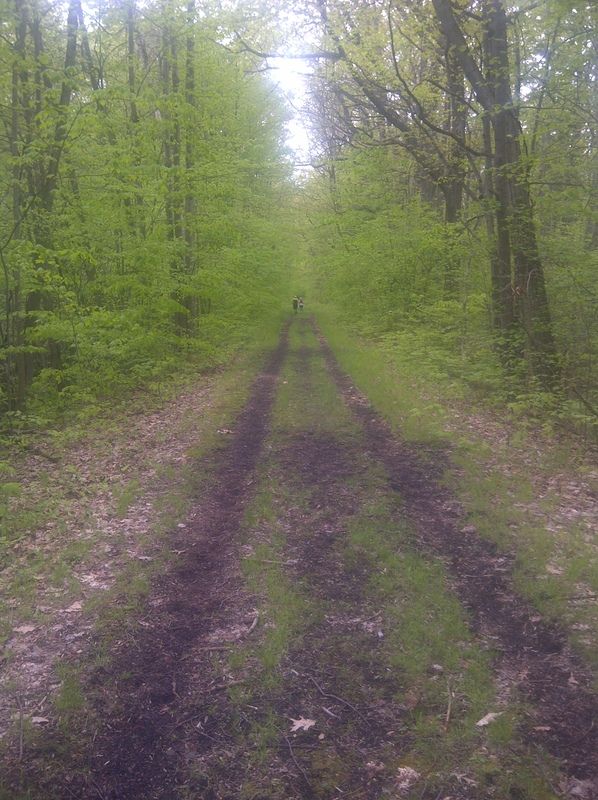 While a marathon is not in my future, if I had to run one it would be in the woods:). Something about back to nature that makes it so much more palatable than the grind of asphalt. Great shots! What a race Carl! so much mud. Yikes. Wonderful to have made the friend connection virtually and then to meet Daniel in person. it sounds like it will be the beginning of a long friendship and one where the two of you share your joy of running. Looking forward to reading about more adventures! Carl no need to apologize at all. It happens to me as well and like you it is certainly not intentional. Wonderful that you and Daniel remain in contact. Best wishes to you both ahead.